I spoke with Dr. Geri Zeldes, on Friday, July 8th. 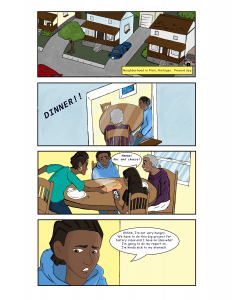 Dr. Zeldes, who received a Heritage Grant from MHC in 2015, has been busy producing a documentary film, “Hubert: His-Story.” Her co-project investigator Stacey Fox, a transdisciplinary artist-in-residence in MSU’s J-School, works on a comic book for high school students in Flint. Her team, which consists mainly of MSU undergraduate and graduate students, has reached the final stages of editing a film based on the inspiring life and work of Flint resident Hubert Roberts. 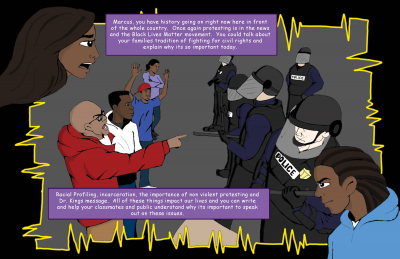 The comic book features African American “superheroes” like Roberts himself, and will be distributed to Flint high school students in print and digital formats later this year. You can check out a couple of images at the bottom of this post. Mr. Roberts was born and raised in Flint, and had a promising start as a young man working for his uncle’s vending machine business. When a homeless man, whom Roberts had taken into his home, stole money from him, Roberts’ indirect attempt to retaliate resulted in charges of conspiracy to kidnap and assault the man. After serving 14 years in prison, Roberts was diagnosed with a fatal pituitary tumor, given 3.5 years to live, and released from prison. That was 15 years ago. Since his diagnosis and release, Roberts has spent much of his time volunteering as a mentor for young men in Flint public high schools. He uses theater, props, and humor in his storytelling to introduce students to little known events in African American history, inspiring them by making history come alive in unexpected ways. Zeldes said “it’s like sneaking broccoli into a kid’s food”—students don’t even realize how much they are learning about history, because they have so much fun when Roberts is at the front of the classroom. Colleagues and family members describe Roberts’ generous spirit and boundless energy. Roberts is passionate about teaching history to young men in Flint because he believes that “history is indicative of who we are today.” He tries to get his students to think outside the box, because “they have been cultured to think in a certain way about themselves.” On field trips to penitentiaries and universities, young men are encouraged to envision and reflect upon whether they want to end up in a prison campus or a college campus. He tries to give them the tools to build self-esteem and confidence in their abilities, using history as a conduit. Dr. Zeldes is excited to engage with such a unique initiative in Flint, which she calls “a great hub for the humanities.” She cites the Flint Cultural Center, which hosts an excellent museum, symphony, and concerts, as an important space for the city. Flint occupies an important place in the history of Michigan and the American automotive industry. In the wake of the nationally publicized Flint water crisis, Zeldes is thrilled to be able to document a positive part of the city’s history during this “crazy awful wonderful period,” from which she knows it will emerge stronger, as it has so many times before. Zeldes believes that empathy is the foundation of cultural understanding. The MSU students on her project team, many of whom had never visited Flint before, have developed a new sense of understanding and cultural competency as they interact with people in Flint. As the film and comic book reach a wider audience, Zeldes hopes they will have a similar effect—dispelling misconceptions and stereotypes about Flint, and building a greater sense of empathy and appreciation for the residents of this remarkable Michigan community. – Shana Melnysyn, Ph.D. was MHC’s Mellon Public Humanities Fellow during the summer of 2016. Geri Alumit Zeldes, Ph.D., is an associate professor and graduate studies director in MSU’s School of Journalism, and the project director for “Hubert: His-Story.” Dr. Zeldes has won seven best paper awards, and more than two dozen honors for her documentary films and other creative scholarship, including a Telly, two regional Emmys ®, and many others. She has also received grants from the Michigan Humanities Council, Ruth Mott Foundation and others, and was invited to speak at two Tedx events. Raised in Flint, Zeldes says that while she spent the first 18 years of her life trying to get out, she has spent the last decade working to reconnect with the community.